Back in the late 80s my knitting life changed in a wonderful and colorful way when I discovered Kaffe Fassett and his first knitting book, Glorious Knitting. Up until then I'd been knitting sweaters from patterns in magazines or pamphlets - fun and interesting but none were anything like a Kaffe Fassett sweater. It was love, or maybe lust, at first sight. I wanted to make almost every pattern in the book. Here it is, about 25 years later, and I still want to make a great many of his designs from this and his subsequent books. Back then I had to order the yarn from shops in England. I didn't have a computer then so it meant writing letters to stores that were listed in the back of the book to ask if they had the yarns I needed, waiting for a reply, then getting an International money order and sending it off. I remember anxiously waiting for the package to arrive and savoring every ball and skein when I opened it up. On a trip to London, probably around 1988 or 1989, I thought I had died and gone to heaven. I visited a shop called Ries of High Holborn (now, sadly closed) and spent so much time in the shop ogling the Rowan yarns that I'm sure the clerks wondered if I was ever going to leave. There was a wall of 4-ply Botany yarn with every color of the rainbow. I checked out each and every little skein. There were kits in a nice box with a window showing the pattern. I wanted to take all of them home with me, and few did make the trip! After Ries I went to Liberty of London and saw more kits. I was on sensory overload. Kaffe Fassett's patterns lead to a fascination with other designers that used Rowan yarns: the Seatons (a particular favorite), Sasha Kagan, Annabel Fox, Jean Moss, Kim Hargreaves, to name a few. Since then the list has become longer. I've made several of Kaffe Fassett's designs, many completed, some now on the needles. Here's a list, although I'm sure that I'm forgetting some. Some are in Ravelry and I plan to put the rest in, too, in order to keep an up-to-date journal for myself. Foolish Virgins Pullover (F); Icon Pullover (F); Domino Pullover (F); Mosaic Sweater (F); Tumbling Blocks Sweater (F); Tapestry Leaf Sweater (F); Blue Diamonds Pullover (F); Jubilee Throw (P); Triangle Squares Cushion (P); Whirling Star Sweater (Y); Lacey Cardigan (Y) and another finished pullover - the name escapes me at the moment - I'll call it Crosses (F) for now. I'll have to take out the books and look it up. That can be time consuming, however, as I can spend hours and hours looking through these books. There is another sweater, too, a variation on a design he did with houses on it, also (F). Since discovering Kaffe Fassett, et al, I've been a Rowan fan, too, purchasing the Rowan magazines from the beginning. I feel very lucky. So....having said all that, today I got an email from Rowan announcing a Kaffe Fassett knitalong. You know that I was powerless to resist. I'll be signing up and knitting the afghan, maybe the oblong cushion later on, we'll see. Of the four suggested colorways I'm currently leaning towards Turquoise. You can see the shopping list here and there is an introductory video to be found here. 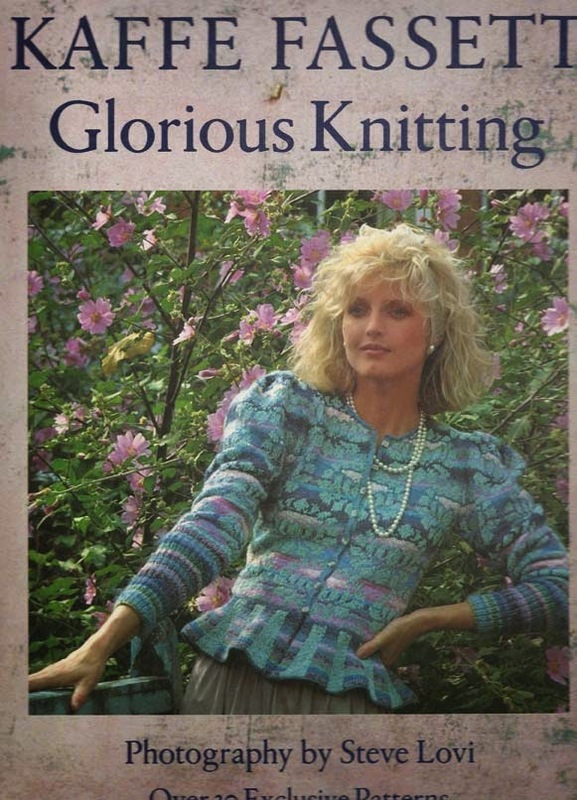 I predict that it's going to be a very popular knitalong. In the video he says that it will be fairly simple in design. I'm just hoping for LOTS of color. It'll be fun to watch everyone's progress on Ravelry. There's not much there now but my Ravelry project page can be found here.